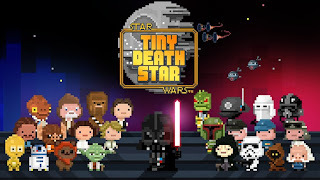 Combining the addictive gameplay of NimbleBit's Tiny Tower with the juggernaut that is Star Wars rewards fans of both with the hybrid Star Wars: Tiny Death Star. Tiny Death Star is a game of building resources to generate more resources so players can build more resources. Long story short, it's a classic time sink. Building a Death Star is expensive. And despite the vast pockets of the Emperor and Lord Vader, it's going to take a little bit more to get this machine of terror built. That's where the player comes in. It's up to them to build new levels on the Death Star to attract new tenants, bitzens, to live, work, and shop on the space station. Levels must be constructed one by one and become increasingly expensive to build. Once a tenant moves in, they must be assigned a job in the multitude of shops that can be built. From there, product must be ordered and stocked to bring in the substantial amounts of money required to continue building. There are steep time limits on building new levels and stocking product. This is where the time sink aspect comes in. Players can only do so much in one sitting before they're forced to wait for the desired action to complete. Of course, this process can be completed immediately by spending Imperial Bux. Imperial Bux are a special form of currency awarded for completing special objectives. Alternatively, they can be purchased with real world money. There are loads of Easter eggs and nods to Star Wars universe that are definitely entertaining. Checking the Holonet provides plenty of humor as the bitzens share their thoughts on living in the Death Star through a Facebook-esque social forum. Tiny Death Star is available on several platforms and I found that it played best on my Lumia 920. The vertical aspect fit well with the screen. On the tablet, the screen is locked in the horizontal position with a lot of wasted space on either side of the screen. It would have been great if it were possible to rotate the screen and play it in a vertical mode. Even better would be the ability to have the game sync across the platforms. As it stands now. I have a separate game running on each platform. While Tiny Death Star is enjoyable in the small bursts I play it in, I have no desire to keep three separate games running. Especially when I'd be building the same design three times over. Tiny Death Star is fun, but is limited because of what it is. But if you're looking for something to kill a few minutes and have an itch for Star Wars, this is the game for you.